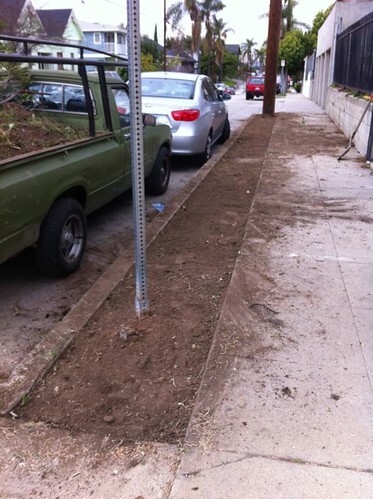 We removed the grass (and crap grass) from the parkway. The design concept was to add two trees and (3) mini-succulent gardens spaced out on the parkway and have Dymondia (see blog post on this ground-cover) fill in the rest of the area. Due to timing the trees went in first. 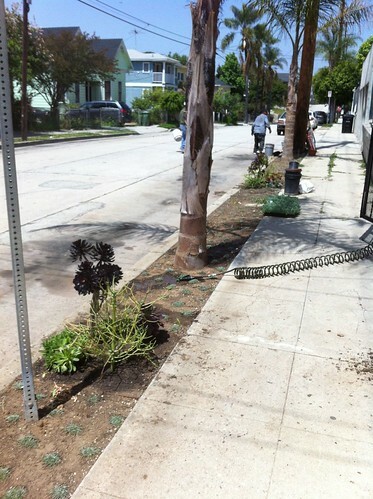 We used Queen Palms since they are the dominate parkway tree on the street. 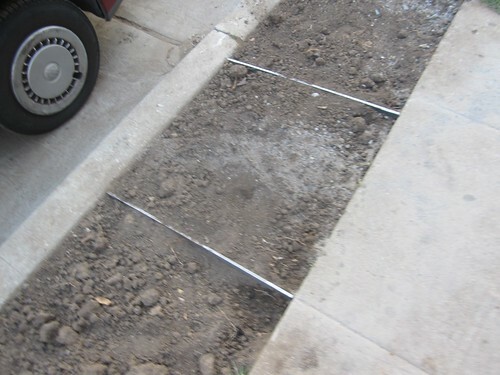 After the trees were planted, flags for the three mini-gardens were put in place. Typically three cars can park in front of this property. 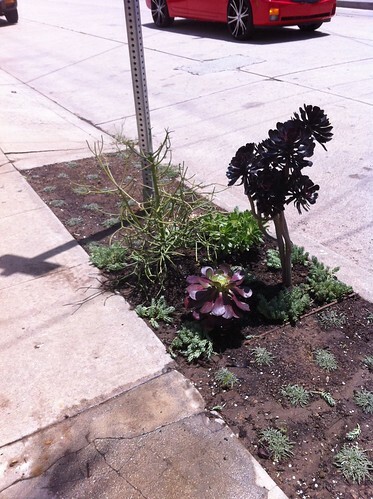 Care was taken that the location of the mini-gardens would avoid the locations where car doors would likely be opening. It was important that the mini-gardens be contained and have strong edging to that it would be tidy and neat for the long haul. Since steel was being used to create steps and terraces in other parts of the project I decided to adopt it for the parkway as well. I measured the width of the parkway (approx. 31″) and had 1/4 steel cut. Each of the 6 pieces was a slightly different width. 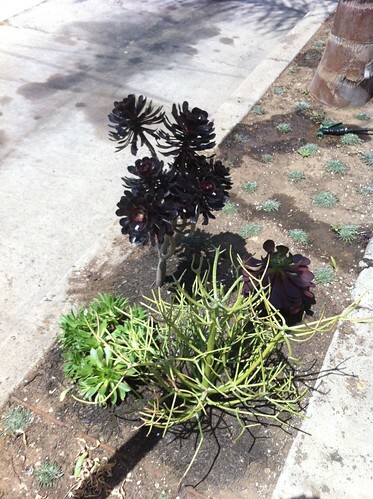 A few weeks later, after the soil was amended and the Dymondia was planted we finished planting the mini-gardens. 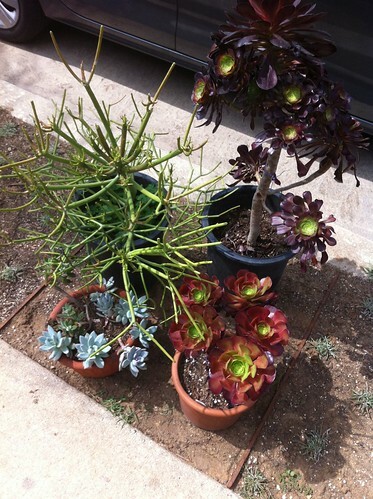 I used a combination of plants I already had in pots in the test garden and new plants from Sunset Nursery and Echo Park Nursery to create the new plantings. 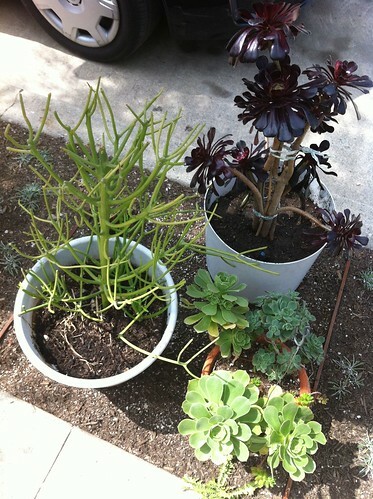 We sat plants in place to audition them and decide on the plant layout. 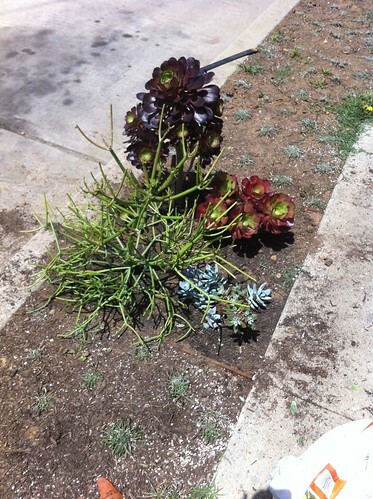 Once satisfied, we planted the succulents. The parkway has no built in irrigation. It gets watered occasionally with a hose. Within a year or so the dymondia will grow in a be a durable walking surface. In the meanwhile I weed a lot.